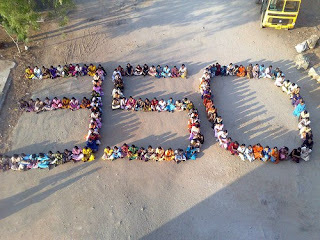 I will always follow the word of Bill Mckibben and his new project 350.org, which stands for bringing our world back to 350 parts per million (ppm), is gaining momentum all over the world! This weekend on October 24 check the website for activities planned in your community and if there isn't one plan your own 350 movement! The timing here is crucial—there is a narrow window when we can have the most influence in international climate politics. Too early and we're irrelevant, too late and we've missed our chance to have a real impact. Though the final climate meeting in Copenhagen doesn't take place until December, governments will be finalizing positions before the meeting takes place. Late October may well be our best chance we have before countries set everyone that negotiates for the United Nations climate talks will get their final orders. Also, October 24 is United Nations Day. We are very pleased about this connection, because through our work, we hope to honor the work of the United Nations as an institution—it is truly the only global institution suitable to the task of a global climate agreement. We are actively working with the UN for the 24th. With creative actions happening all over the globe, and photographs of those events appearing online, in the media, and on politicians' desks, we will change what these negotiators think they can achieve right before they make the important decisions of the UN treaty. 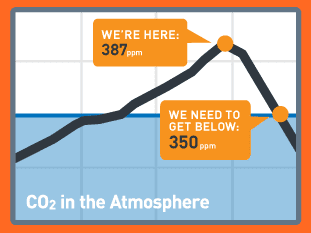 Right now most of them know the science of 350ppm, but they don't think it is politically possible. On October 24, we are going to show them that not only is 350 possible, but it is what everyone all over the world is demanding they do. Accelerating arctic warming and other early climate impacts have led scientists to conclude that we are already above the safe zone at our current 390ppm, and that unless we are able to rapidly return to 350 ppm this century, we risk reaching tipping points and irreversible impacts such as the melting of the Greenland ice sheet and major methane releases from increased permafrost melt. read more about this by visiting the 350.org website here. 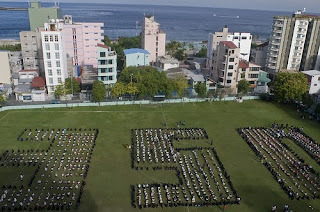 A good way to get involved is to visit your childs classroom and share the 350.org information. Kids love to hear about people getting together to help the earth be a better place and the 350.org website has a bunch of helpful tools to help you talk to your kids about ways to stop the pollution of our planet and take a stand for a safe climate future. 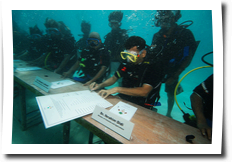 One of my favorite initiatives so far is the president of the Maldives, Mohamed Nasheed, and his ministers held an official cabinet meeting UNDERWATER to draw attention to the pressing issue of climate change that immediately effects them. As the ocean water starts to rise their island nation is sinking. 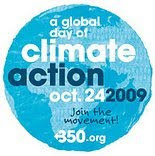 Their statement will be brought forth to the UN climate change talks in Copenhagen in December of this year.